Zurich-based jewellery designer Simona of Vivien Frank Designs (VFD) creates artistic accessories that has retro elegance. The successful Swiss brand has a very comfortable and local boutique air about it, and that’s truly because the designer is behind everything she sells. She is making each piece by hand. Many of her designs are evocative of expressions from the seventies era. If there was ever such a thing as festival-glamour this might fit the bill, but on an entirely new level of arm-candy class. Think, wooden prayer bracelets with Pavé diamonds and a world recognised favourite … the “friendship bracelet,” a contemporary upgraded version. The VFD collection is an accessories melting pot with classic crafting materials used of wood, beads, chain, and macramé that’s kicked up several notches! Then, the pieces are paired with sterling silver, gold, or diamond elements, amongst others. The collection offers everything from charming statement bracelets to dainty necklaces. For the multi-accessory wearing devotee, all pieces can either be layered, stacked, or worn alone. Simona has even thought about kids accessories—it’s highly appropriate since the brand name was formed with esteem of her own two children, Vivien and Frank. With a background as a film editor, Simona left that industry to tend to her son, Frank. But, being a creative means that inspiration is always on the horizon, shortly afterward she started producing extravagant gemstone necklaces. (Above) Burma Jade bracelet w/ tassel, 14K Diamond discs necklaces (comes in white, yellow and rose gold), Tiny Initial Charm necklace, Delicate Silver on Black Silk bracelet, Kids-Pink Sterling Silver Large Link bracelet, Pavé Diamond discs bracelet and Turquoise Teardrop earrings. Simona describes her own designs as “modern bohemian,” which is suitably fitting for the aesthetic of her work. Initially a hobby, jewellery making became a wonderful way to express herself as an artist. As a result, it has an ageless impact and global appreciation. Presently, Vivien Frank Designs are sold worldwide. Her pieces have no particular age group in mind. There are pieces that are easy to incorporate in wardrobes—from casual outfits to city-savvy sophistication. I have my eye on a few favourites below, including my custom VFD initial name necklace. 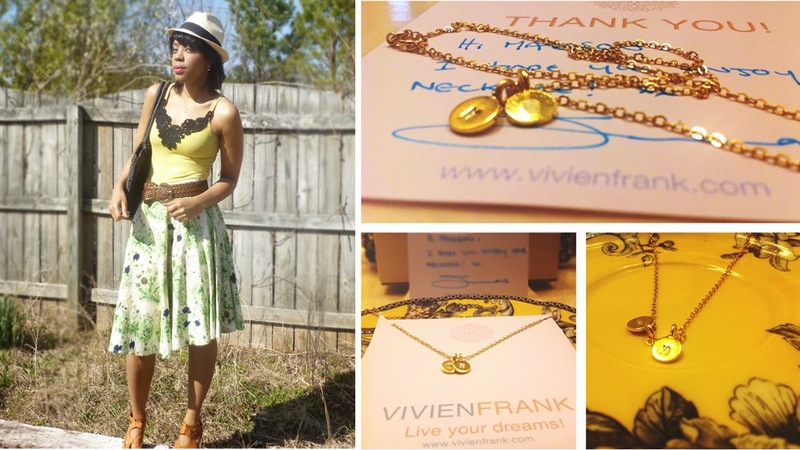 Take a look and check out my top selections from the Vivien Frank jewellery collection. What do you think of Vivien Frank's designs? What's your favourite piece? 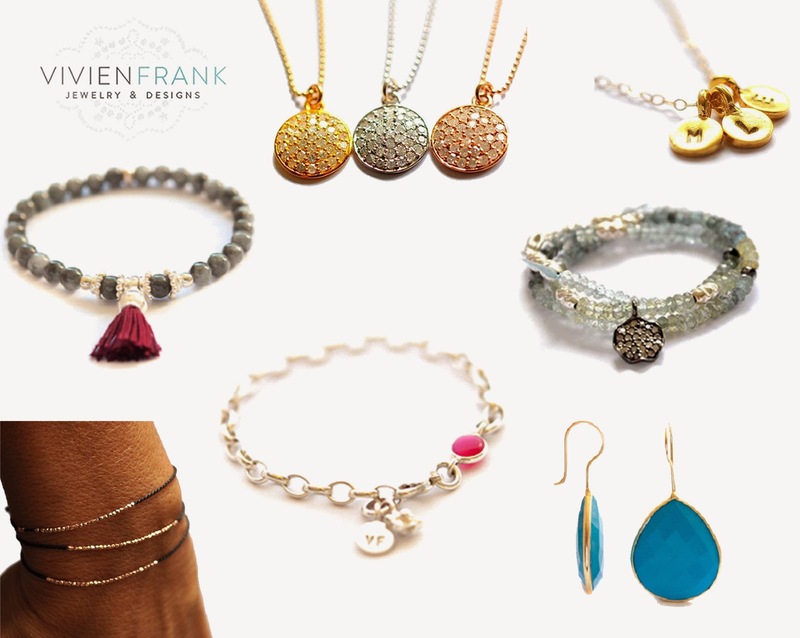 You may shop the Vivien Frank Design collection here, and also online at Boticca. Hi Madison, i didn't know this designer! I love these jewels! The jewellery looks so beautiful. I haven't heard of this brand before. How cute she named it after her kids. The initial name necklace and the cute rosegold ones are my favorites. Happy Friday Madison !! Her designs are breathtaking - I really love that cross bracelet! Looks like a lovely range of designs with a classic and modern appeal. The necklace you got is really pretty! Those pendant necklaces are gorgeous! Love the rose gold! I think the initial necklaces are quite cute, but that skirt in your outfit is what I'm loving the most here. I adore these daintier pieces, they are really feminine and so pretty. Thanks so much for kindly stopping by...wishing you a marvelous weekend! Those diamond disc necklaces are lovely, especially the rose gold! VFD make such pretty beauties - great feature! I really like the bracelet with the red fringing dripping off it. I think that's a nice little touch and a bit more original than having charms that a lot of companies use. they are very pretty! i love the daintiness of the bracelets and necklaces. chic bohemian! gorgeous! love your outfit madison. that yellow tank and floral skirt looks pretty on you. Wow, da sind wunderbare Sachen dabei, ich bin ganz begeistert! Besonders die Armbänder.... und ich liebe hübsche Armbänder! Liebe Rena, Danke. Ich bin so froh, dass Sie meinen Frühling Rock-Muster gefallen ... und Sie die Armbänder gefallen, auch wenn Sie nie tragen sie. Sie ist ein guter Designer! Thanks Kim! So glad that you also like her designs. It's nice for the designer to have other feedback from bloggers. Hope you enjoyed your weekend. Thanks for reading Lu. Yes, independent designers and emerging artists are some of my favourites! Glad that you liked the feature. Thanks Sam. I agree, and there's a nice feminine sophistication to many of the pieces. Thanks! Yes, do check it out! <3 I'm happy that you love them too. Thanks for reading Erika. That's so wonderful Lilli. I'm sure the designer will appreciate your sweet compliment. It was my pleasure to introduce you to a new brand. :-) Thank you. I love the turquoise drop earrings most! You're very welcome Madara. Thanks for your comment. What a beautiful necklace sweetie!